On this afternoon Caching we attempted to find 2 Caches around the South beach of Bridlington. Tracy Joined to help me on this search as Mrs M was feeling a little green around the gills. The co-ordinates for the first cache took us to a metal structure holding up a piece of modern art work, from all the clues given the cache was a magnetic nano hidden underneath the structure but alas we couldn't find it. There are far to many hiding places and this is definitely better suited to a gang hunt. The picture above shows the hiding place. The second hunt was more successful. The cache was about 1km away from the previous cache, well hidden underneath a concrete 2nd world war bunker. The Beach on the South side of Bridlington is very large and provides a nice backdrop for a pleasant walk. We were fortunate enough to catch the RedBull Kite surfing championship which was being held on the beach that afternoon - truly impressive stuff. Pictures from the cache and nearby. A Kite surfer taking part in the british championships. 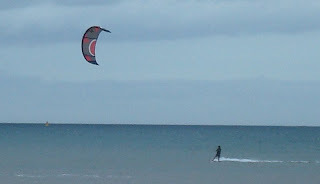 A number of Kite Surfers.